I posted pics of the kitchen in the mountain cottage we recently moved into yesterday. Here is the adjacent dining area. A dining bench and pillows finally arrived this week. The table is an antique from Dovetail Antiques in Cashiers, NC. I will visit one day and take photos to share on the blog, a great shop. A woodworker is going to raise the legs next week to accomodate the chairs and allow for more legroom. 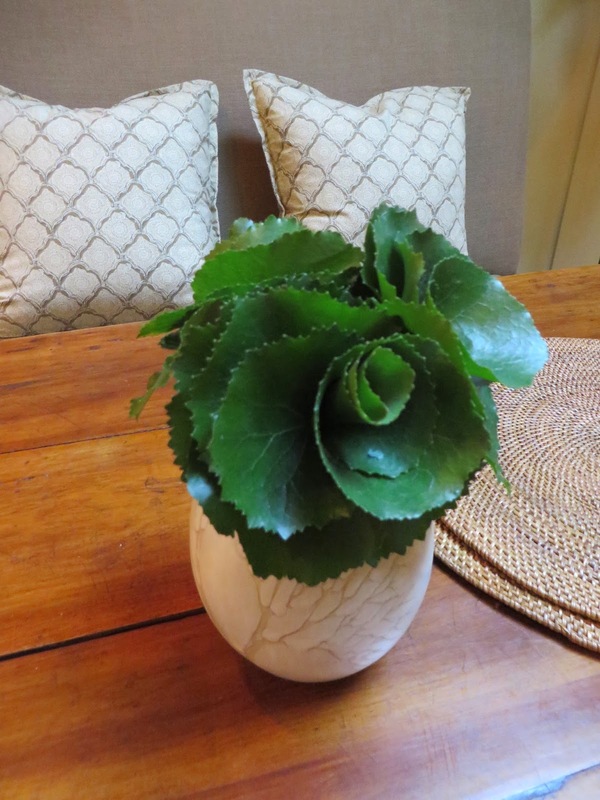 The arrangement is a group of mountain galax leaves formed into rosettes, available at Vivienne Metzger Antiques, also in Cashiers. Another post worthy destination, I love her shop too. The pillows are Kravet's Kashmira in Mineral. The interiors of the cottage will be hard to photograph because of weird light. The skylight is over this area. The wall color is not yellow, but a creamy light beige. The photo below reveals the real color. There is another dining area in the corner of the living room, our kitchen table from the old house, so we can accommodate a larger group when needed and also use it as a work area. The lamps on the buffet have matching bulbs and shades, why are they looking wonky in the photo? The buffet is waiting for a mirror that I have yet to discover. Hope I can find something rustic and modern. Also need to style the tabletop, this area is the next project. I like the scale of furniture you chose. It fills the space well and is very inviting. PS-just noticed your new header! Beautiful! I think a sweeping photo fits wonderfully. Cindy: What a timely post…for me. We have been thinking of doing a banquette, or dining bench like yours, in our eating area. But, do you find it a problem to slide in and out with the fabric? That is our huge question. We use this area constantly and now have upholstered Parsons armchairs. But even after just four years they are showing so much wear; I've always wanted a built in banquette (husband not so much…) but am concerned about the fabric issue. Comments? thanks!